Form of a noun or verb indicating its application to two persons or things. Arabic is the only Semitic language that has the dual form for the verb as well as for the noun; in Syriac only a few traces of the dual have been preserved. 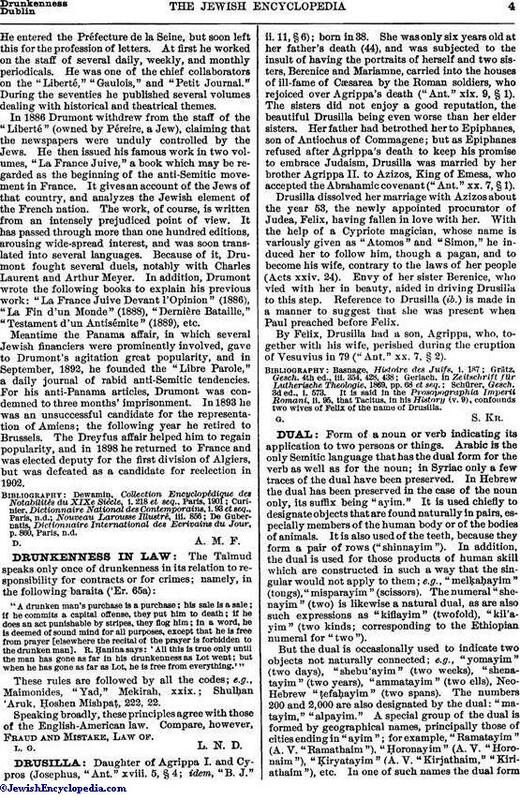 In Hebrew the dual has been preserved in the case of the noun only, its suffix being "ayim." It is used chiefly to designate objects that are found naturally in pairs, especially members of the human body or of the bodies of animals. It is also used of the teeth, because they form a pair of rows ("shinnayim"). In addition, the dual is used for those products of human skill which are constructed in such a way that the singular would not apply to them; e.g., "melḳaḥayim" (tongs), "misparayim" (scissors). The numeral "shenayim" (two) is likewise a natural dual, as are also such expressions as "kiflayim" (twofold), "kil'ayim" (two kinds; corresponding to the Ethiopian numeral for "two"). But the dual is occasionally used to indicate two objects not naturally connected; e.g., "yomayim" (two days), "shebu'ayim" (two weeks), "shenatayim" (two years), "ammatayim" (two ells), Neo-Hebrew "ṭefaḥayim" (two spans). The numbers 200 and 2,000 are also designated by the dual: "matayim," "alpayim." A special group of the dual is formed by geographical names, principally those of cities ending in "ayim"; for example, "Ramatayim" (A. V. "Ramathaim"), Ḥoronayim" (A. V. "Horonaim"), "Ḳiryatayim" (A. V. "Kirjathaim," "Kiriathaim"), etc. 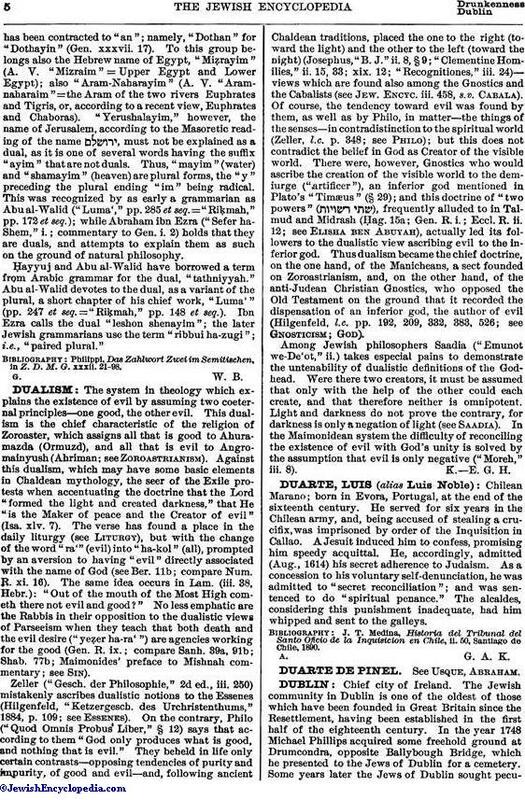 In one of such names the dual formhas been contracted to "an"; namely, "Dothan" for "Dothayin" (Gen. xxxvii. 17). To this group belongs also the Hebrew name of Egypt, "Miẓrayim" (A. V. "Mizraim" = Upper Egypt and Lower Egypt); also "Aram-Naharayim" (A. V. "Aramnaharaim"=the Aram of the two rivers Euphrates and Tigris, or, according to a recent view, Euphrates and Chaboras). "Yerushalayim," however, the name of Jerusalem, according to the Masoretic reading of the name , must not be explained as a dual, as it is one of several words having the suffix "ayim" that are not duals. Thus, "mayim" (water) and "shamayim" (heaven) are plural forms, the "y" preceding the plural ending "im" being radical. This was recognized by as early a grammarian as Abu al-Walid ("Luma'," pp. 285 et seq. ="Riḳmah," pp. 172 et seq. ); while Abraham ibn Ezra ("Sefer ha-Shem," i.; commentary to Gen. i. 2) holds that they are duals, and attempts to explain them as such on the ground of natural philosophy. Ḥayyuj and Abu al-Walid have borrowed a term from Arabic grammar for the dual, "tathniyyah." Abu al-Walid devotes to the dual, as a variant of the plural, a short chapter of his chief work, "Luma'" (pp. 247 et seq.="Riḳmah," pp. 148 et seq.). Ibn Ezra calls the dual "leshon shenayim"; the later Jewish grammarians use the term "ribbui ha-zugi"; i.e., "paired plural." Philippi, Das Zahlwort Zwei im Semitischen, in Z. D. M. G. xxxii. 21-98.